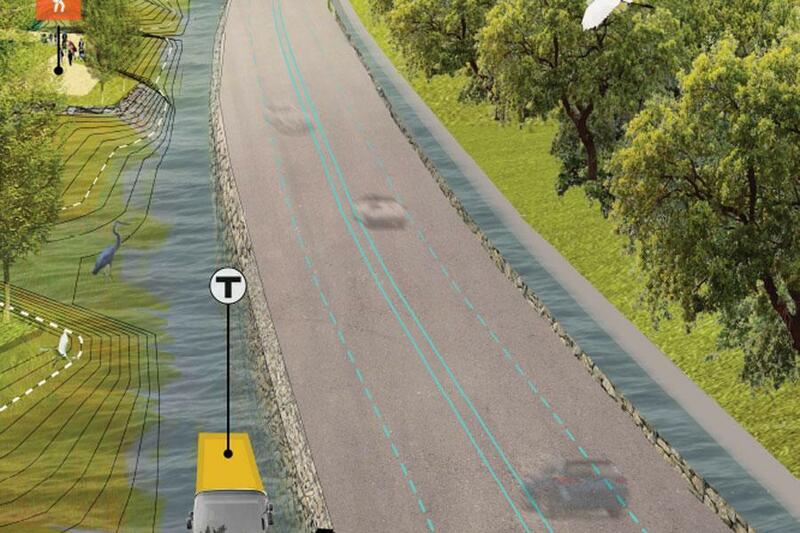 In 100 years, when rising sea levels are expected to spill over onto flood-prone Morrissey Boulevard, commuters may be able to ditch their cars in favor of an MBTA water taxi. The proposal to build transit canals alongside the low-lying thoroughfare is one of 50 ideas floated by designers in a $20,000 competition sponsored by the city, which is looking for plans that could help Boston accommodate predicted flooding linked to climate change. Other ideas called for the construction of “living levees” in Fort Point, which could soak up water during storms but also support floating structures — including apartments and a farmers market that would rise and fall with the tides. Called “Boston Living With Water,” the contest drew interest from design and architectural firms from around the world, officials said. The competition launched with the help of the Boston Harbor Association and the Boston Society of Architects on the two-year anniversary of Hurricane Sandy last year. A look at some of the redesigns submitted in a $20,000 competition sponsored by the city. The “most successful” designs are now viewable in a gallery on the competition’s website. Organizers omitted firms’ names to allow for the jury to evaluate the proposals without bias. To solicit submissions, contest organizers selected three vulnerable spots in Boston for design firms to work with, areas that they say are at risk of coastal flood dangers. The sites are Morrissey Boulevard; Fort Point Channel; and the Prince Building, located in the North End. One firm developed a concept dubbed “MorriSEA Parkway,”which reimagines the boulevard as an inter-modal landscape that relies less on cars, and more on a new transportation network of amphibious MBTA ferries along a channel near wetlands. 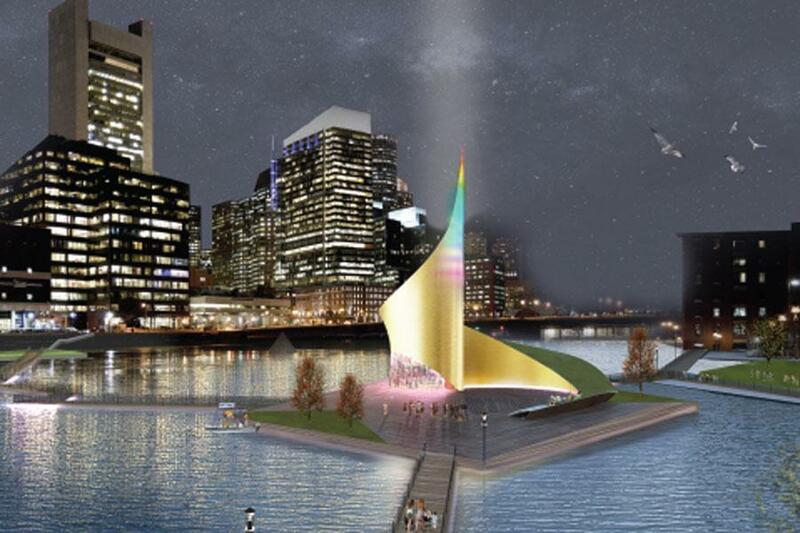 The plan would link South Boston, the UMass Boston “peninsula,” and recreational areas along the Neponset River. “The canal’s soft edge permits water movement into a...greenway where floodplain vegetation absorbs nutrients and transpires water,” designers said of their proposal. Another submission looks to embrace the water surge in Fort Point by creating a water-saturated urban living space with raised streets and building complexes, as well as a floating park. “As a mangrove floats above the water, so would the floating park. As water levels rise within storage pools the land would float atop it, instead of being inundated,” designers said. The ”RE/creation District,”a plan that took aim at trying to figure out how residents in Fort Point could live with flooding, envisions floating pedestrian walkways and a public piazza on an island. To deal with sea level rise, special tidal pools would collect water, filling up during storms, and later empty out as the tide recedes. On the website, people can vote for their favorite designs, but a panel of experts will decide which renderings will move forward in the two-phase contest. Dalzell said the judges will whittle down the design submissions to nine for an event at the BSA Space at Atlantic Wharf next Wednesday, but all 50 proposals will be on display for the public to look through following a panel discussion. In the next phase of the competition, judges will select the top design plans from the pool of submissions — three from each of the locations used as the basis for the project — and later, pick the top design in each category, with one clear winner taking home the cash prize.